I love this pizza. Like so much. I’ve been really focused on eating more whole-food, unprocessed, and oil-free meals recently (It’s been going well if you’re curious! ), but you gotta have moderation--you know? So step aside all-other-options-one-could-have-in-moderation, it’s Pizza Day! I posted a blog post about vegan pizza over a year ago but I’ve changed some things and have added vegan cheese so I think it deserves another blog post and a video. This time I’ll be showing you exactly how I make a vegan pizza, step by step, including making our white-bread-pizza-dough from scratch. Alright! Onto the video! Flour a countertop, table, or large cutting board. Make sure to have an extra handful or so of flour off to the side of your floured surface available for you to grab from because the dough will be sticky. Flour your hands and place the dough onto your floured surface. Sprinkle some flour over your dough. Knead the dough for about 10 minutes, re-flouring as necessary. Using a brush, paper towel, or your hands, oil your large bowl and place your kneaded dough inside. Cover with a warm damp towel or tin foil and a towel and let the dough rise for 1-2 hours until it’s doubled in size. Bake for about 20 minutes or until the crust starts to brown and your toppings are cooked. I was on such a pizza kick recently, I’m surprised I didn’t post about this version sooner! Pizza is such a fun food to make on a Saturday night with friends and/or family or even if you made one solely for yourself--homemade pizza makes a regular evening so much more fun! 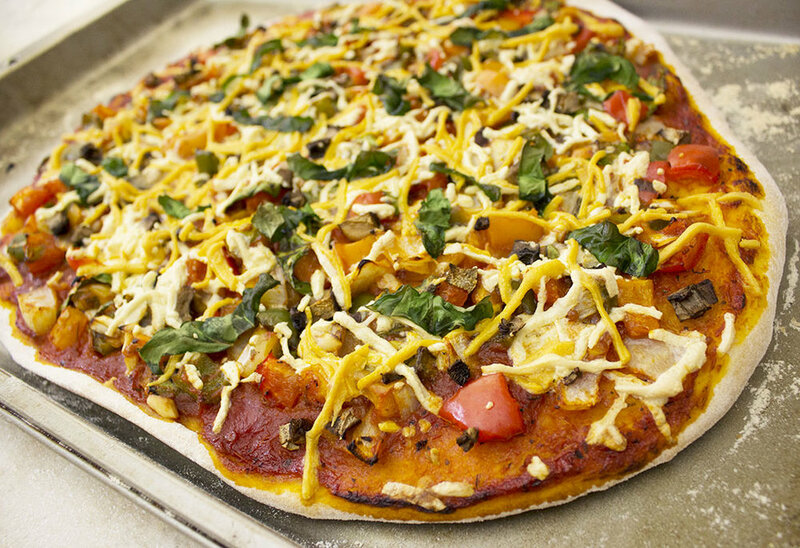 If you love pizzas, which I’m assuming you do, and your vegan, which you might very well be--heck even if you’re not--you’re gonna LOVE this pizza! I know we do! I hope you guys have a wonderful weekend, and of course, I hope you guys get a chance to make a regular day into a homemade pizza-riffic day! See you on Friday!